The City of Ransom Canyon is found 9 miles east of Lubbock, Texas, in Lubbock County. It is a scenic cluster of homes with distinct architecture and geology. On behalf of the City Council and all of our wonderful citizens, We would like to welcome you to Ransom Canyon. Our community is truly unique. 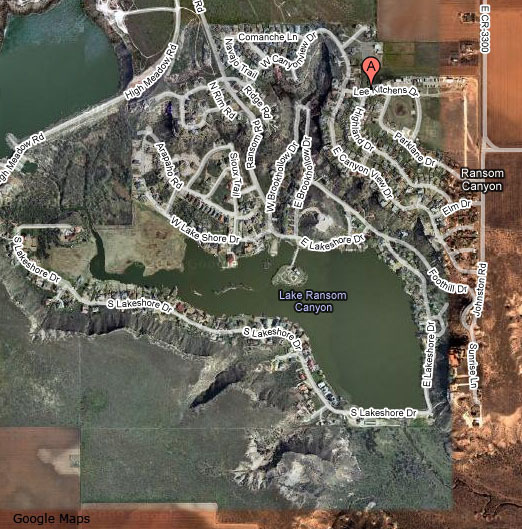 Just 15 miles east of downtown Lubbock, Texas, Ransom Canyon is a planned community with scenic homes overlooking a sparkling lake. The city lies in the south eastern part of the Yellowhouse Canyon, in the upper tributary of the Double Mountain Fork of the Brazos River. In the great, wide open space of West Texas, Ransom Canyon is a beautiful oasis with the friendliest 1,100 people you will ever meet. We extend a personal invitation to you to get involved in your community. Regular City Council meetings are held on the second Tuesday of every month at City Hall at 6:30 pm. We hope to see you there! Ransom Canyon will be recognized as a diverse, safe community; preserving its natural beauty, aesthetics, and ambience for all citizens to enjoy. Enhance the quality of life for citizens by being responsible stewards of the public trust and delivering outstanding services.